Divides your view of the world! Multi-facet clear plastic lens. Assorted colors. 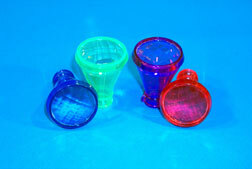 2 inch transparent prism scopes. $3.45 per dozen for 48 dozen or more. $2.95 per dozen for 96 dozen or more.